Bangladesh women’s cricket team won toss and asked India to bat first in Women's T20 Asia Cup at Kinrara Academy Oval, Kuala Lumpur on Sunday. Earliar on Saturday, Bangladesh stormed into the final of the six-nation Women's T20 Asia Cup for the first time after a huge 70-run victory against host Malaysia. In the day’s match, batting first after winning the toss, Bangladesh scored 130 for 4 in 20 overs and restricted Malaysia to 60 for 9 in 20 overs. Player of the match Shamima Sultana [43 off 54b; 5x4] and Ayasha Rahman [31 off 27b; 2x4; 1x6] built up a solid partnership of 59 off 9.5 overs in the opening stand before Ayasha was caught by Mahirah Izzati Ismail off Sasha Azmi. Fahima Khatun [26* off 12b; 3x4] and Sanjida Islam [15 off 12b; 1x4] contributed 36 off 3.3 overs in the 4th stand to carry the remaining maximum load. Fahima-Sanjida started from 87/3 in 16 overs and ended on 123/4in 19.3 overs as Sanjida was run out. Malaysian skipper Winifred Anne Duraisingam (2/19) and Sasha Azmi (1/29) shared three wickets for the side. Mas Elysa [14 off 18b; 3x4], WA Duraisingam [17 off 35b; 3x4] and opener Yusrina Yaakop [11 off 21b; 2x4] were the double digit scorers for the losing side. 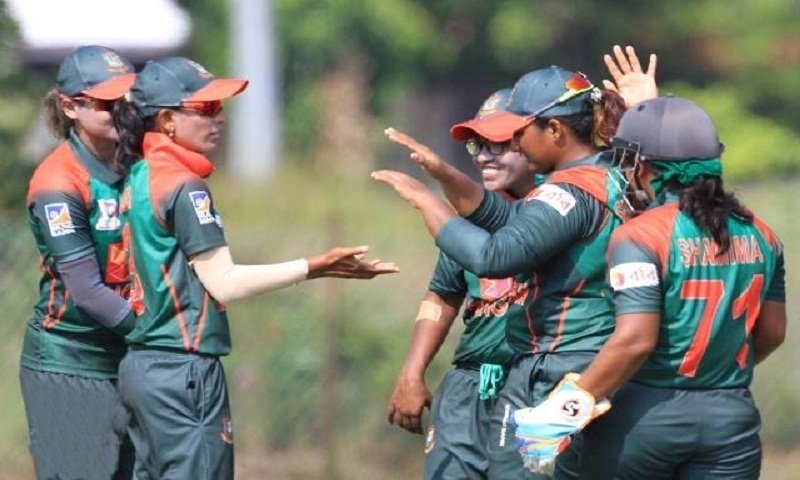 Rumana Ahmed (3/8), Khadija Tul Kubra (1/8), Jahanara Alam (1/9), skipper Salma Khatun (1/9) and Nahida Akter (1/13) shared seven wickets to handle Bangladesh’s bowling department. Earlier, Bangladesh started the campaign in the meet with a six-wicket loss against Sri Lanka in the first game, and then bounced back for three successive victories; registering seven-wicket wins each against Pakistan and India before crushed Thailand by nine wickets. After the league phase battles, Bangladesh and India recorded matching collection of eight points, having identical win-loss of four wins against one loss, but India ahead of Bangladesh by virtue of more net run rate.